Of course, for so many years I am accustomed to the warm winter of Greece, where the lowest temperature is at most at zero in the evenings. This year, however at Surrey, I have to face something new! And something too cold! I’ve been in so many places in my life that are very cold like in Austria or Switzerland. I have to tell you that two days ago March came, which means spring is almost here, but the UK is all dressed in WHITE! It has been snowing for about 5 days and the temperature feels like -12 and I think you will agree that climate change is a current phenomenon. 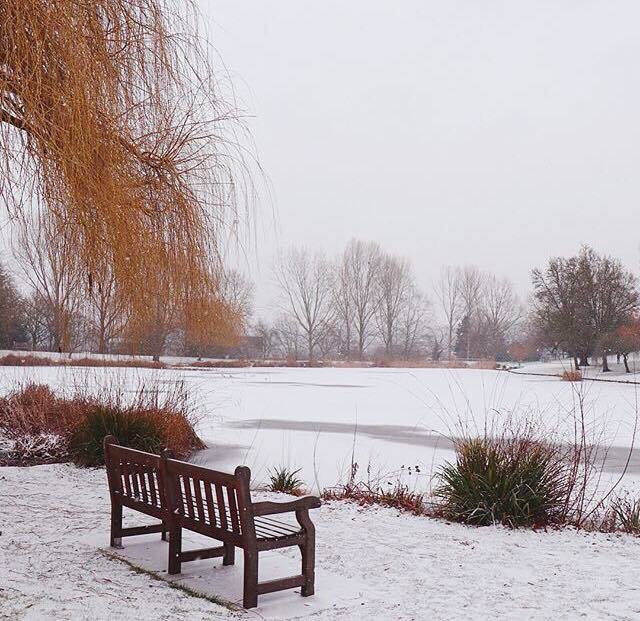 Nevertheless, the positive aspect of this weather is that the campus looks so beautiful, the lake is currently frozen which means you can go for ice skating (actually do not try it) and finally it reminds me of Christmas time. As we are in the second semester, the weather is not helping me to focus on my coursework as I look constantly the snow falling outside my window. Some lectures during this week were cancelled because of the weather conditions, but I hope from next week we will be back on track !! Looking forward for spring to arrive in our beautiful campus and make it colourful again ! !